Inputting these settings in no way will harm your set. We Calibrate to the standards of the film industry. Calibrating isn’t to make the brightest and punchiest picture but to replicate as much of the directors intent as it can. If you try out the settings and you don’t like them then it’s really easy to reset them back to normal. People on this thread are really helpful so if you notice anything feel free to let us know so we can compare and reproduce it. Please just be respectful as we put in a lot of time to figure out all of the ideal settings and also post them for everyone to use. Thanks everyone! Below I will post calibration settings from various users that have posted them. If you update them please edit original posts so the links line up with your current settings. Thank You! Googer, DJ Lushious, e03179 and 17 others like this. Last edited by beardontwalk123; 05-09-2018 at 02:41 PM. Hyabusha, jstew9, VBB and 20 others like this. Last edited by shoman94; 11-25-2018 at 02:48 PM. Ninhalem, JoinTheBattle and JMacIV like this. I much prefer this set with flat gamma vs. BT.1886. I targeted 2.22 power law. I am thrilled with current results. Used free grayscale patterns from Masciola and played via Roku Ultra. I found that the 50% works, but rest of 11-pt do not. Still, it let me dial things in much better than with just 2-pt. I wonder if this would help w/ others that have been adjusting the backlight for mid-ranges? Hello Everyone, I started this thread so that we could share our calibration experiences and settings. The 2014 P Series was tough to calibrate and I want to make sure we don't clutter up the owners thread so please keep posts here about calibration. I will start by posting my settings. Here is my Calibration for the P65-C1. I calibrated to BT.1886 and Rec. 709 with light output of 40fL or 137cd/m2 with ALZ off, and I turned it back on after Calibration. The 2pt Calibation brought everything in the 11pt sweep below deltaE of 3. Usually you don't want to copy 11pt settings anyway. I had gotten everything great with CMS but then when I went to watch actual shows the skin tone was awful so I left CMS at default for now until some bugs get worked out. In order to get Reduce Motion Blur to work, Reduce Judder must be set to at least one. That is another little bug that I see getting fixed in the future. I have read that you are not supposed to adjust the Green setting. Is this untrue? I thought that also.....Calman says to measure to the lowest measured color.....which in my case was Red. I am open to other opinions on this. I calibrated my 65P today with Color HCFR and an i1DisplayPro probe. Here are the settings I wound up with, targeting a max brightness of Y=120. Auto Brightness: Off for calibration. I have been using it for regular viewing and enjoy it. Like manually adjusting backlight for the viewing environment, it doesn't seem to affect the calibration. Backlight: 12 for Y=120. Disabled if using Auto Brightness control. Sharpness: 20. I didn't evaluate sharpness with a test pattern. It is likely too high out of the box. Harlock415, Hyabusha, VBB and 20 others like this. Last edited by beardontwalk123; 06-13-2018 at 09:02 PM. Can anyone point me to a good walkthrough for doing a calibration with HCFR.. It use to be true, when many sets would suffer from green push. I am a novice at calibration so i have a question that I've been wondering about or a while. I calibrated my 65p the other day, and during the color management portion of Calman I'm curious about the CIE 1931xy graph. So since this set has LCH, I'm assuming you ignore the RBG graph, and use the LCH graphs for your adjustments. What I'm curious about is the DeltaE the only thing you should worry about, or should you sacrifice some DeltaE to get the CIE 1931xy dots to move into the Squares for each color? Or does that graph not matter at all and DeltaE is the only thing I should worry about? I've always wondered about that during the CMS portion. Are you talking about the saturation points,(0, 25, 50, 75) or just 75, which would be the only visible squares on the CIE chart? What you want, is all saturation points across the gamut. That affects many of most common colors used. In Calman Advanced Home advanced workflow, the section where you 'adjust Color Management System'. I'm assuming that the color patterns for the primary and secondary colors are all 75%, as you adjust them you can get a lower DeltaE value on the one graph while in turn move the dot farther away from it's target on the CIE chart. I was curious if being in the target zone was more important than having a lower deltaE. Not a huge deal, I was just always curious if one was more important than the other. Or if they were equally important. Now that I've sat here and thought about it, I think I may have answered my own question. You know it could be that the DeltaE is lower with the dot being farther away because the CIE graph is only 2 dimensional and you're actually measuring a Z axis too. So while it may 'seem' closer on the graph displayed, it's actually not because the DeltaH is actually further that isn't displayed on that CIE graph. So probably lower detaE is the most important. I recognize that we are mainly discussing Rec. 709 signals and not HDR, but this display is all about extreme contrast, etc. How important is it to account for luminance in grayscale calibration? What target should we be using for this display? I'd imagine it depends on viewing environment a lot as well, yes/no? There seems to be quite a difference between the 65in and 75in displays. its not necessarily harmful but it is somewhat pointless. Green is most of the light output, so with 2pt controls changing green offset is more or less equivalent to adjusting the brightness control, while changing green gain is roughly equivalent to changing the contrast control. You should use 2pt red and blue adjustments to bring white into balance, and set brightness and contrast to set black and white level. VBB and thomasfxlt like this. Well when I calibrated mine at 50% I bumped the Backlight to 100% after and rechecked 11pt GS and it was unchanged. then I did the same down to 15% which gave me around 130nit at 100% and again the 11pt balance was unchanged. The fact that greyscale didn't change, seems to point to part of why HDR works. What nits did the meter read with backlight at 100%? It was in the 500's but I don't remember the exact number I wanna say mid 500's. The Delta E's on color look surprisingly poor. The CIE chart shows greens to be clearly skewed off from all saturation targets. Is it not possible to adjust the CMS on this set to get these under 1.5? It was recommended I should not touch them at the moment. But I do plan to read more about it and what to change to adjust them along with the impact on other settings they will have. Fwiw I'm a noob at this. It looks like the hue line is tracking towards DCI targets instead of rec709. Setting colorspace to "auto" may default to a wide color gamut target. Perhaps, but it's not accurate... 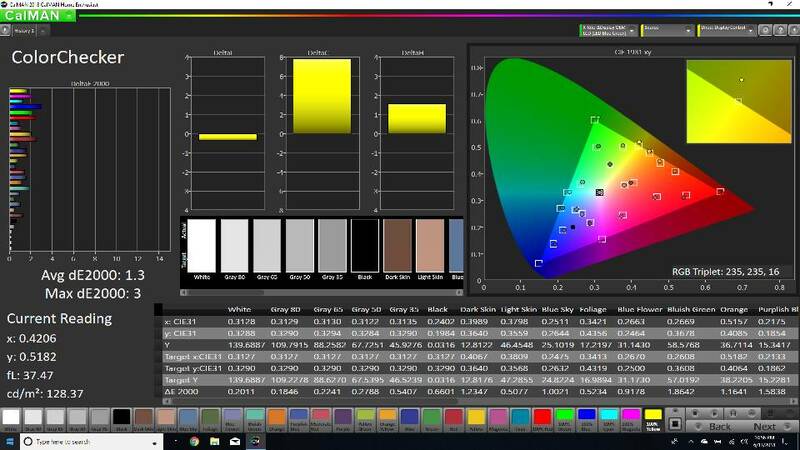 The only time you should be using P3 or 2020 color space is for HDR content which is mastered that way. For everything else, rec709 is the only accurate way. 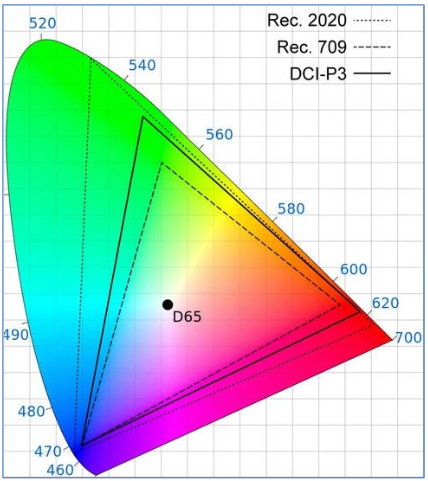 Would love to see a CIE diagram and dE chart for primary/secondary colors with the color space set to rec 709. The colors are in no way unrealistic to me. Everything looks so real to me that's why I said it pops. The HCFR software is configured to REC 709. Also P3 is not ENABLED on the tv. It's set to Auto which is YCbCr. The triangle is what it is. The colors likely need some fine tuning but at the moment that's going to take some understanding by me before I make those adjustments. More so the actual adjustments I should be using and what other aspects of the calibration it's going to effect. Edit ; Does it matter that I'm using my laptop to send the colors thru HDMI to the Display from the HCFR software? Does the output from the laptop need to be set a certain way? Last edited by shoman94; 04-11-2016 at 04:06 AM. Your dots should be getting closer to your target square as you lower deltaE with LCH or your Luminance, Saturation and Hue. Hope that helps. I understand that the targets need to be in the box but as an example which setting should be adjusted to just green. Then after that setting is made, what other adjustment would likely be needed because of it? Last edited by shoman94; 04-11-2016 at 07:00 AM. That's the thing, humans are very bad at telling the difference between accurate colors and inaccurate colors without a meter. While you might think it "looks so real", if it has a deltaE of 3, it is a color shift error. There the only color information on a Bluray or 1080p video feed is inside the rec709 CIE triangle. The capture here shows the colors being rendered outside of that triangle, and with a shift on angle as you get farther away from grey. There's no magic that allows a screen with a WCG to guess what colors were originally there that were removed in the production process, nor any way to infer what the director intended if the gamut had been larger. The point of calibration is to have the screen show the image exactly as intended by the director. You would need to either burn these to a DVD or Bluray and use a bluray player, or copy the .mp4 files to a thumb drive and have some device that is capable of playing it handle it, or stream it to the TV using Chromecast or AppleTV or something of that nature. Be careful to make sure that any streaming software you use passes the video along as "h.264 pass through", and doesn't re-encode the video, as again, that might introduce error. Don't get me wrong, I'm not trying to just give you hell about the screen -- I have been watching the P-Series thread with a lot of interest, and I checked one out at Best Buy. I don't own one, but I have no alleigance to Sony, Samsung and LG. It's clear that no matter the result of final calibration that the P-Series is a great screen at that price, and a huge step forward for Vizio. Excellent native contrast, good local dimming, a great concept for the remote control, etc. But that doesn't mean you should ignore what meters say as far as color accuracy. Rtings review had a similar problem -- high delta E on colors. 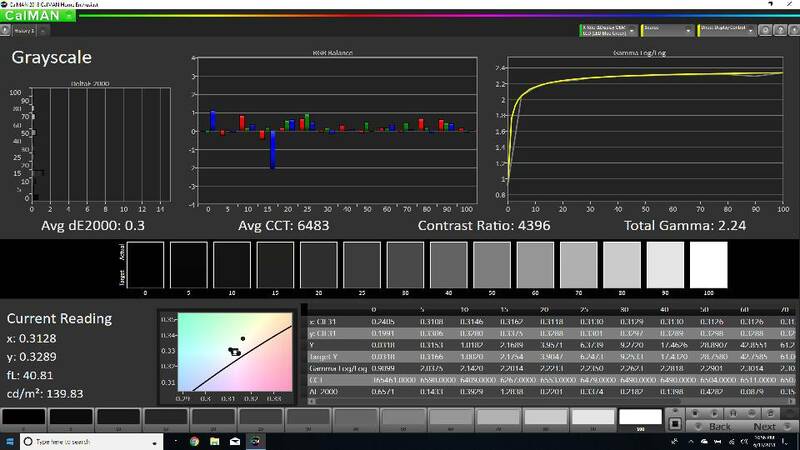 If you compare it to calibration reports for Sony x930c/x940c (Rtings has one for the x930c), you can see that the delta E, even after calibration, is 2-3X higher on colors for the Vizio than for Sony or Samsung. This is the AV *Science* forum, and this is the Calibration Sub-Forum. Calibration is not a matter of "making the image look the way you like! ", Calibration is about making the image appear exactly has it was intended by the director. 10k, shoman94 and hungro like this. I understand that the targets need to be in the box but as an example which seeing should be adjusted to just skat green. Then after that setting is made, what other adjustment would likely be needed because of it?